Haganta is a new large blue plum variety from German. 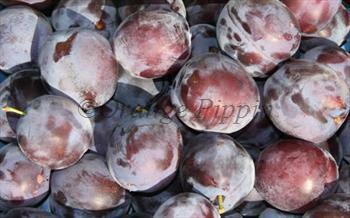 It is one of the latest-ripening of all plums (September), and therefore a great way to extend your fresh plum season. It makes a good alternative to the traditional English late-season purple plum, Marjorie's Seedling - Haganta arguably has a better flavour, as well as being a bit later. The plums have an attractive scent. They also last well, both on the tree and then can be kept for a couple of weeks in a fridge without loss of quality. Haganta is one of the heaviest-cropping of all plums (although not in the same league as Victoria). The stone separates quite easily from the flesh (free-stone). Haganta® is a protected variety. Please fill in the details below and we will let you know when Haganta plum trees are back in stock. An essential variety for German-style cake and pastry recipes. Plum pox virus: Very resistant? If refrigerated, will keep longer than most plums? Haganta is in flowering group 3. Haganta is partially self-fertile, but fruiting will be improved if there is a compatible tree of a different variety nearby. Since it flowers in the middle of the blossom season it can be pollinated by most other plum trees. Haganta is partially self-fertile, and also has good disease resistant. The tree is fairly vigorous and productive. Haganta was developed at the University of Hohenheim in Germany, and released in 1985. It was developed to have specific resistance to the plum Sharka virus. It was developed from a Canadian variety called Valor, which in turn is derived from two old plum varieties, Imperial Epineuse and Grand Duke.